JAKARTA – McCann Worldgroup Indonesia has launched a global TVC drive for Coke to connect with youth markets during the Muslim fasting month of Ramadan. s Eurasia division, McCann in Indonesia won the right to produce this year’s Ramadan drive, following a selection process with Pars McCann Turkey and Promoseven Middle East, which created 2007’s TV spot. The TVC, dubbed ‘Iftar Street’, is being showcased in 16 markets including Turkey, the Middle East (which includes the UAE, Oman and Saudi Arabia), North and West Africa and Asia (which includes Indonesia, Pakistan and Bangladesh) and will run for six weeks until October. For Indonesia, the TVC drive will be further extended to coincide with the Lebaran holiday period – a time of celebration for Indonesians as they conclude their fasting month. Aimed at teens and mothers, the 60-second TV spot sees two male leads being caught in a bad traffic jam. 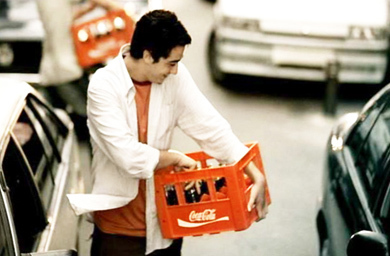 Spotting a Coke delivery truck, the two then begin distributing the soft drink among the rest of the commuters. As the sun sets, the group begins eating and drinking to celebrate the end of the fasting day. This entry was posted on September 16, 2008 at 2:49 am and filed under Advertising,Islam. You can follow any responses to this entry through the RSS feed.